Below is a list of clients the Medingenuity has helped with business development, web design, corporate identity and branding, or direct-to-consumer communications for medical practices. 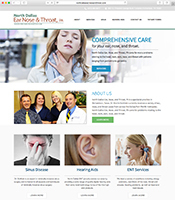 North Dallas Ear, Nose, and Throat, PA is a specialist practice in Richardson, Texas, a suburb of North Dallas. Dr. Morris Gottlieb currently receives a variety of ear, nose, and throat cases from across the Dallas/Fort Worth metroplex. The medical practice called upon MedIngenuity to modernize its logo, and develop a new modern website presence. 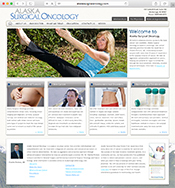 Alaska Surgical Oncology specializes in the assessment, treatment and surgical removal of cancerous and non-cancerous tumors and abnormal growths, including skin cancer. Dr. Charles Portera relocated his practice from Tennessee to Anchorage, Alaska in 2014 and used Medingenuity to help launch the new practice. Medingenuity developed the new name of the practice, the corporate identity, a content-rich educational Internet presence, a variety of educational handouts on skin cancer, breast cancer and other topics that help consumers with early detection of cancer. Medingenuity developed full page magazine ads for Alaska Surgical Oncology and installed a referral development system that communicated to primary care doctors across the State of Alaska and enabled the practice to grow dramatically in its first year. Medingenuity also developed a 16-page HealthQuest consumer guide book that is distributed to patients and other referral sources for their patients. The consumer booklet advises patients on early detection of cancer and when to see the doctor. Medingenuity also provided consultation to the medical practice on access to Ambulatory Surgery Center ownership in the Anchorage market. Dr. Thomas McGunigal has helped thousands of patients on the East Coast successfully find non-surgical relief from carpal tunnel symptoms. Dr. McGunigal called on Medingenuity to upgrade his Internet presence. 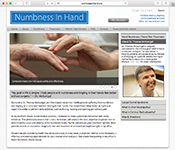 Medingenuity helped the web site improve its visibility to score in the top 20 nationally for the key words “numbness in hand”. 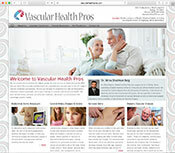 A vascular surgeon wanted to create a new specialty practice serving the DFW market. He called on Medingenuity to develop a new name and corporate identity, web site presence that showcased his capabilities to primary care referral sources as well as consumers who were looking for information about symptoms and surgical solutions to vein and vascular problems.